Make sure it's well done. Mr. Idema added that there is “no silver bullet or universal solution” for creating video ads for Facebook’s mobile platform. On Facebook’s mobile News Feed, for example, users spend on average 1.7 seconds with a piece of content versus 2.5 seconds on desktop, according to data released by the company Wednesday. Additionally, 24% of its videos were understood without sound, compared with 76% that required sound to be understood. 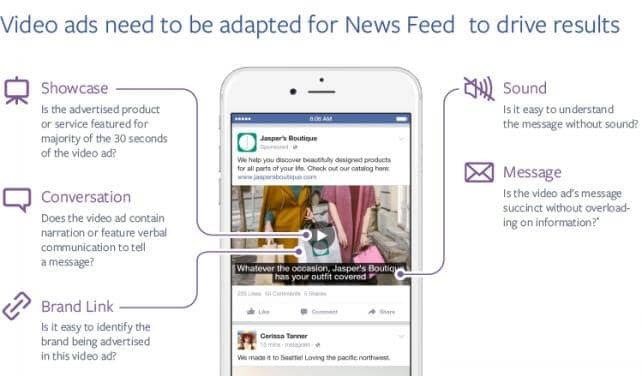 Facebook said marketers should consider screen size, make creative brief but direct to deliver a message, include captions, and experiment with different ideas. “We recommend marketers continue to test, learn and iterate to find the solutions that work best for their brand, keeping a few key creative principles in mind,” Mr. Idema added.